The past continuous tense emphasizes a course of action for something happening in the past. Let's look at several more specific uses and lots of examples to better understand this tense. Before we get started, please note that this is often also called the past progressive tense. The words "continuous" and "progressive" tell us that the action was continuing or in progress. 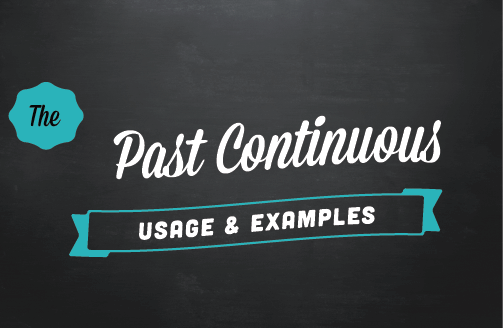 The past continuous tense is used for showing something was happening at some point in the past. Words that often signal this tense: while, during. I was living in Singapore during the 1990s. We were praying for days for your recovery. I was watching movies all night last night. What were you doing yesterday afternoon? I wasn't eating well before the heart attack. We were trying to fix the computer earlier. Our coach was yelling at us during half-time. We use this tense to talk about more than one action simultaneously happening in the past. While you were sleeping I was making dinner. During the tennis match I was serving well and my opponent was making many errors. I was waiting at entrance while my boyfriend was buying the tickets. My mother was washing the dishes and my father was drying them. The dog was eating my food while I was talking on the phone. The year you were traveling in Europe I was studying at the university. When we were attending business school you were actually building a business. We can also use the past continuous to describe the scene for a story or background information about something that happened in the past. The picnic was so much fun. The sun was shining, the kids were running around and the adults were playing volleyball. Of course we were eating good food all day too. What was I doing? I was reading a book and relaxing at home all evening. At the time, we were living in our car and showering in the school gym. We were always praying for help. We can use this to describe irritating or annoying habits that were happening in the past. We usually use "always," "constantly," "continuously," "continually" in these sentences. They were constantly teasing me when I was a child. I was always arriving late for class when I took the bus. Your dog was continually eating my shoes. My old neighbors were constantly playing loud music. Our last roommate was always paying rent late. Sadly, his father was always criticizing him. Before she became a manager she was always complaining about management. I recommend you also review the differences between the past simple and past continuous tenses. If you need to review how to form the past continuous tense please check this page. I go over the positive and negative forms, questions, spelling and give lots of examples.